This double camping hammock supports up to 500 pounds, and folds into an attached sack that weighs less than 2 pounds in total. The full setup will take you less than three minutes. Pack includes the highest quality carabiners and hammock tree straps. 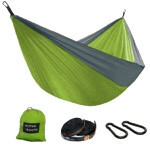 This lightweight portable parachute nylon hammock is ideal for backpacking or the back yard.